The goal of this series of articles is to develop your skills to make smart decisions when making setup changes. The program will install in Trial Mode which means a few file management functions are disabled but otherwise it's fully functional. All the on-road and off-road models that will be used in the demos are also preinstalled to make life easier. We will be delving into things like roll moment, weight transfer balance, roll stiffness, roll centers, roll sensitivity, camber and camber Gain and damping ratio. Some of these terms may seem strange now but if you stick with this series you will gain a better understanding of the effect setup changes have on each of these properties and what each means to handling. 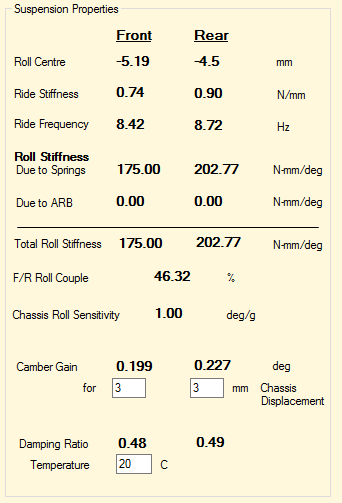 The screenshot shows some the key suspension properties for a 1/10-scale touring car. Get a good grasp on how these numbers relate to your particular chassis and you will be amazed at how quickly and confidently you will be making setup changes. The other goal of this series will be to keep the written word to a minimum so you don't nod off in class. I will also try to keep the videos short to stay focused on the goal. Understanding suspension properties and what they mean is the key to making smart setup choices. There are many suspension properties that affect how your on-road or off-road vehicle handles - and some are much more important than others. We will be focusing on the ones that have the most impact, and most are listed in the Suspension Properties values here. In the first two episodes we laid the ground work by describing the physics and suspension properties behind setup. Now we are going to start looking at specific areas and show how to adjust and manipulate chassis settings to achieve desired handling characteristics. First up is "Weight Transfer" - also referred to as "Balance". This is how the Total Lateral Load Transfer (TLLT), discussed in Episode 1, is distributed between the front and rear of the car. It is one of the primary tools we have to adjust handling. In the previous episode we discussed how to manipulate the front – rear weight transfer balance to adjust handling. Episode 4 will use those same tools to adjust the overall roll stiffness of the car while maintaining the weight transfer balance. 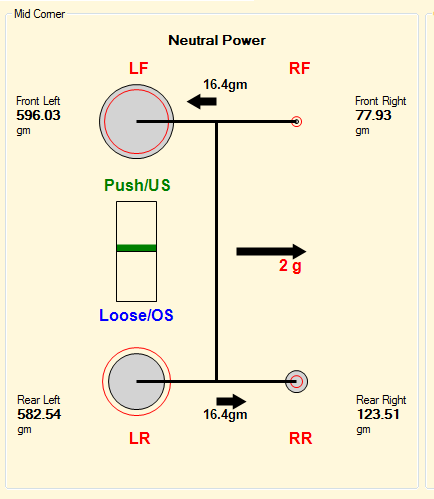 The Chassis Roll Sensitivity value is the primary indicator of this suspension property. 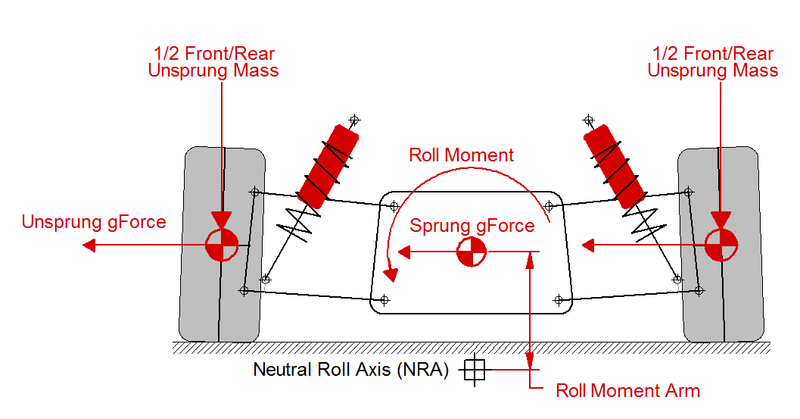 It is affected by Sprung Mass CG, roll centers, and the mechanical roll stiffness due to springs and ARB's. The lower the value the quicker the car will react to inputs, be they changes in direction, bumps or anything else that may be encountered on track. By changing the suspension roll stiffness you are affecting both the amount of chassis roll and camber angle changes so it is important to understand the impact this can have on handling. In this Episode we will be talking about Camber and Camber gain which is all about controlling where the rubber meets the road. The goal being to maximize the tire contact patch with the racing surface over as much of the chassis roll range as possible. Tire construction is a huge factor in determining the useful camber range. A more compliant tire carcass will deform more under lateral loading and allow a wider camber operating range. A harder tire will deform less and will be optimal over a much smaller camber window. 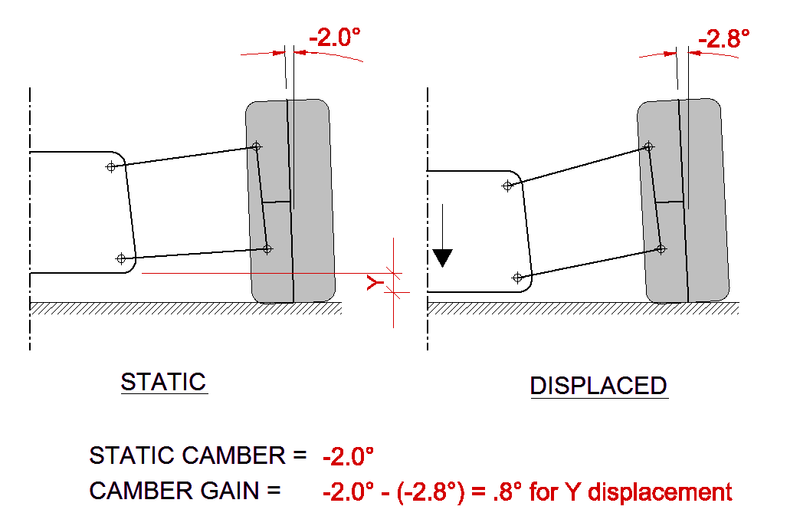 We know that adjusting suspension link positions affect both Roll Center and Camber Gain. What is important to understand though is how they work together to affect the tire contact patch as the chassis rolls. It goes without saying that tire contact patch is critical to optimizing grip. 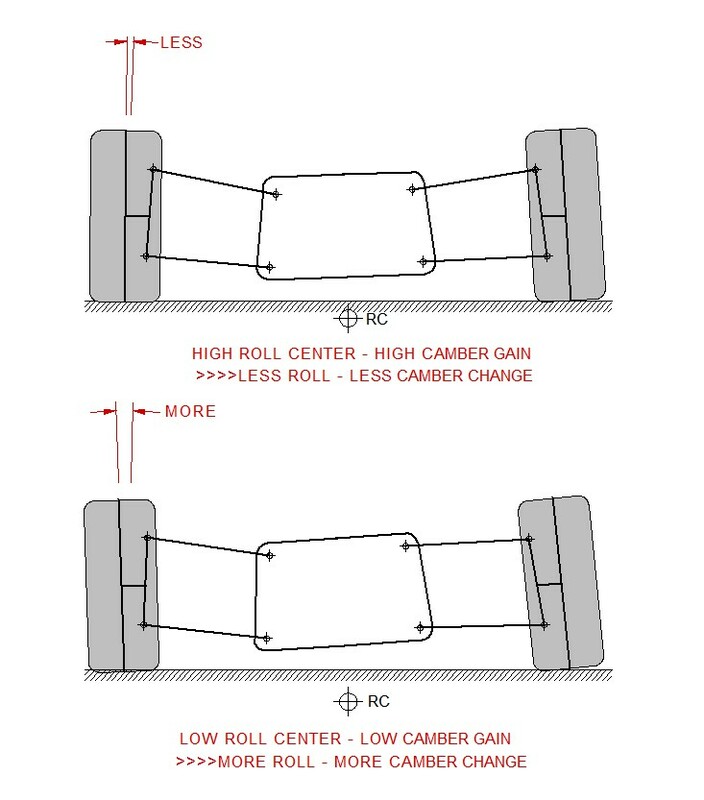 If you consider lowering the roll center in isolation there will be an increase in camber change due simply to the increased roll. However what most don't realize is that lowering the roll center also reduces camber gain since the suspension link geometry has changed. This adds another level of camber change as the chassis rolls. 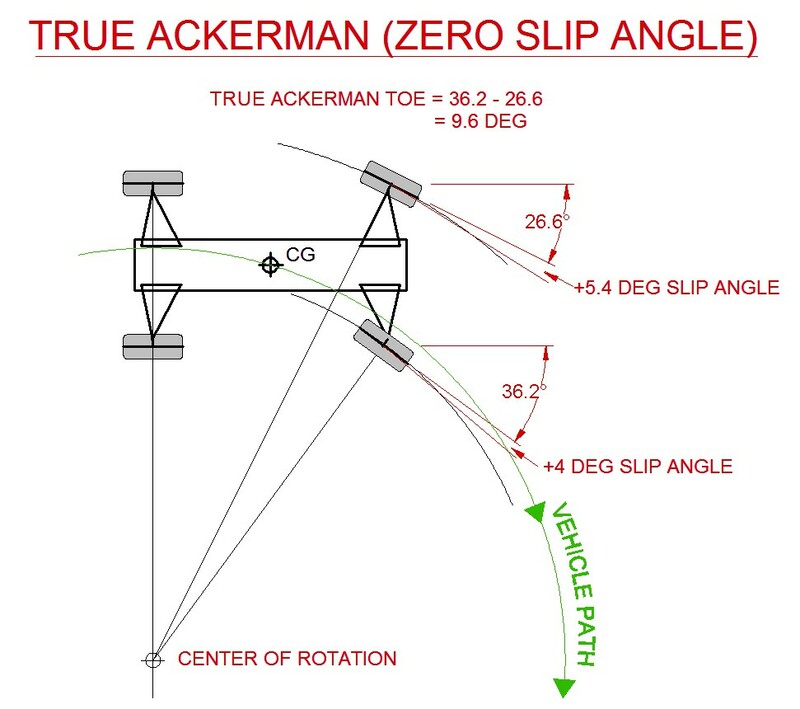 The term "Ackermann" refers to the geometric relationship of a vehicle's front tires when turning, as the inside tire must trace a circle with a smaller radius than that of the outside. The concept can be traced back to British physician Erasmus Darwin in 1758. More popularly, the first linkage constructed for a horse-drawn carriage designed according to this principle was built by Georg Lankensperger in Munich, Germany in 1817 - but it was named after Lankensperger's agent, Rudolph Ackermann, who patented the idea in England the following year. On an RC car, Ackermann can be adjusted by moving either the inner or outer ball studs of the front steering links to a different location, or by installing washers to move the ball studs forward or rearward on some vehicles. If you do any research on the effect of Ackermann (also called Dynamic Toe), you'll find a lot of different opinions. One of the main arguments is that most of the turning is done by the outside wheel so the inside wheel has little effect; while this certainly has some merit at mid-corner, when the inside tire has very little load, it still does have load on it - anything you can do to squeeze a little more overall grip is going to give you an edge. Also, at corner entry and exit, the inside tire has more load on it so it becomes much more effective. Shocks are also known as dampers - they may be one of the most difficult aspects of car setup to comprehend and also to simulate. 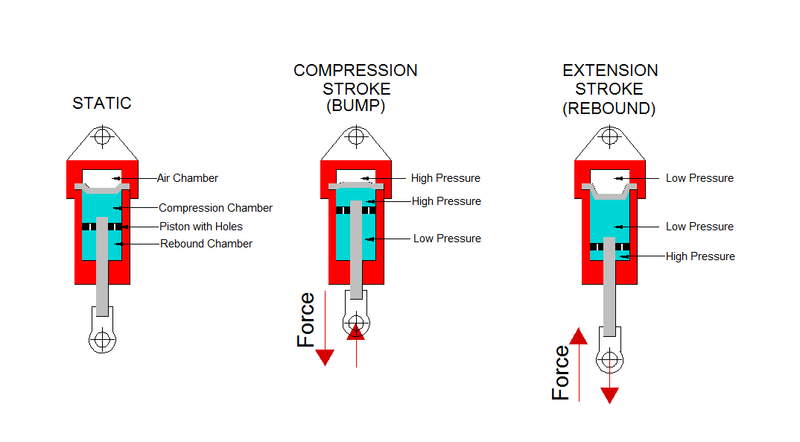 Before we go too far, we need to look at the type of shock we will be discussing in this series of videos, the basic principal of operation, how to quantify damping and how the shock model was validated against test data. Shocks are critical to having a vehicle that can handle the different conditions you can through at it: cornering, bumps and jumps to name a few. They must perform over a wide range of strokes and speeds while keeping the chassis under control. Springs and anti-roll bars provide the muscle and shocks provide the brains. Gain a good understanding of how the work and you will be able to squeeze out a little more performance than the other guys. 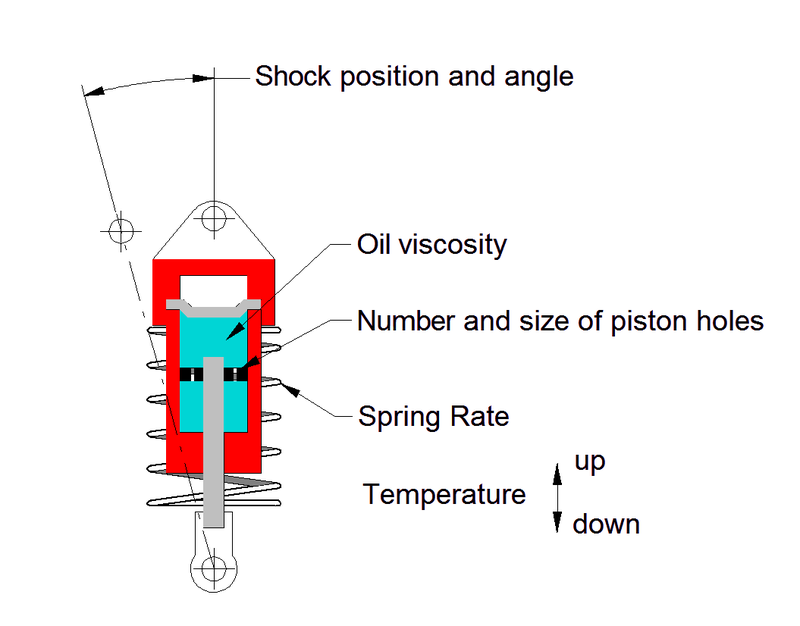 Have you ever wondered what is really happening to damping if you change temperature, shock mounting position, spring rate, number and size of piston holes or oil viscosity? Well, brace yourself, as we are going to find out with a few clicks of the mouse. For those following along we will be using the Generic Truggy model included in the trial version to investigate these effects. If you want to follow along then just download the free trial version of RC Crew Chief from the website.